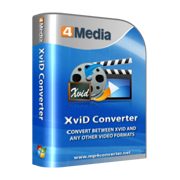 4Media XviD Converter is a powerful XviD video converter which can convert AVI, MOV, MP4, MPEG, RM, VOB, MKV, WMV, 3GP video files to XviD, AVI, DivX, MOV, MP4, MPEG-1/2, MPEG-4 AVC, VOB, WMV, 3GP videos for playback on multimedia devices with high speed and excellent quality. 4Media XviD Converter makes it easy to enjoy movies on your player. This video to XviD converter helps you convert popular videos to XviD, AVI, DivX, MOV, MP4, MPEG-1/2, MPEG-4 AVC, VOB, WMV, 3GP videos. The XviD video converter supports many input videos including AVI, MOV, MP4, MPEG, RM, VOB, MKV, WMV, 3GP. In addition, 4Media XviD converter can extract audios from video files and convert them to MP3 and M4A audios. Using 4Media XviD Converter, you can realize many editing jobs like splitting a file, calculating bit rate, converting video clip, taking a snapshot, previewing the original and the output video, adjusting video and audio parameters. Free download 4Media XviD Converter now and enjoy your digital life. Convert various popular videos to XviD, AVI, DivX, MOV, MP4, MPEG-1/2, MPEG-4 AVC, VOB, WMV, 3GP files. Extract audio from video and convert your videos like AVI, MOV, MP4, MPEG, RM, VOB, MKV, WMV, 3GP to MP3 and M4A audios. 4Media XviD Converter can convert more than one video file in batches at a time. It's time-saving. Provide the fastest conversion speed as it completely supports dual-core or multi-core CPU. NVIDIA CUDA & AMD APP technology helps you to convert videos in excellent performance beyond your expectation. A free file splitter that splits any supported file into multiple smaller files with the customized split time or file length. Directly convert the segment you want from the original file by setting its start time and duration. The adjustable output settings enable you to customize bit rate, frame rate, codec, resolution, sample rate. Get more than one files in the same content at a time by adding multiple profiles for one original to convert. You can use the built-in Bitrate Calculator to predict the output file size and have the bit rate calculated for you. After-done options will eliminate the need of waiting at your computer till the conversion is finished. This XviD converter allows you to finish the video to XviD conversion tasks in the background so you can do other things at the same time. Preview video files with the built-in resizable player and capture your favorite movie images during preview and save them as JPG, GIF, PNG, BMP pictures.